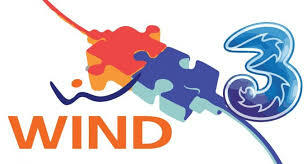 Quite recently, the European Commission has approved, under the EU Merger Regulation, a proposed telecommunications joint venture between Hutchison and VimpelCom in Italy (you can read the press release here), namely among their Italian subsidiaries H3G (better known through the 3 brand) and Wind. While Wind is currently the third largest operator, active both in the fixed and in the mobile sector, H3G is the fourth mobile operator by size. The merger would possibly create a company with the largest share of the mobile telecommunications market in Italy, and reduce the benefits for customers deriving from a wider competition among operators. However, no details of any quantitative analysis appear to have been released by the EU. Here we try to gain some deeper insight through the use of the well known tool represented by the Herfindahl-Hirschman Index. The Herfindahl-Hirschman Index (HHI for short) is a concentration index that measures how a given asset is concentrated in the hands of a few. If we a consider a marketplace, the HHI is defined as the sum of the squares of the shares of that market owned by the individual players. If we measure the shares as fractions rather than percentages (i.e., taking values between 0 and 1, rather than between 0 and 100), the maximum value the HHI can take is 1 (monopoly), while its minimum value is 1/n for a market of n players (perfect competition, where the market is exactly divided among all the players). Therefore, the higher the HHI, the less the competition, and viceversa. The HHI is officially used by both the Federal Trade Commission and the Department of Justice in the USA to measure the level of concentration in a market. Those agencies generally consider markets in which the HHI is between 0.15 and 0.25 to be moderately concentrated, and consider markets in which the HHI is in excess of 0.25 to be highly concentrated. As can be seen, the newco would be the top player, but we would have three operators sharing the whole market (well, just more than 95% of it) among themselves in roughly equal shares, with the HHI jumping at 0.307, definitely a highly concentrated market. If we refer to the Horizontal Merger Guidelines published by the FTC, this 0.5 increase in the HHI is way above the 0.2 threshold deemed enough "to be likely to enhance market power". That's not the kind of situation any competition authority would like to see...Well, we must say that the green light from the EU came at a condition, namely that the newly formed company would release some of its assets to Iliad, so as to allow the French company to enter the Italian market. The exact amount and type are reported in a press release by Iliad itself. But what would the effect of such a move be? 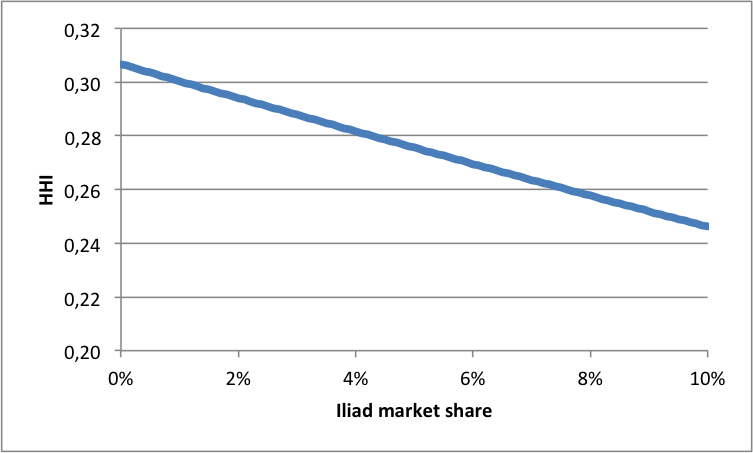 Estimating what fraction of the Italian market Iliad can achieve to grab is not an easy task. Maxime Lombardini, CEO of Iliad, stated in an interview that their aim is to get a 10% market share. M. Naldi and M. Flamini. "Interval estimation of the Herfindahl-Hirschman index under incomplete market information." 2014 UKSim-AMSS 16th International Conference on Computer Modelling and Simulation (UKSim), 2014. This entry was posted in Information economics. Bookmark the permalink.